The Gem Center for the Arts fosters creativity, innovation, and collaboration. Located on Boise’s Bench, the Gem Center for the Arts was created to fill a growing need for art studios, gallery space, and a small theatre in the Treasure Valley. The Treasure Valley is especially lacking in venues for larger scale art, installation art, mixed media, and technology arts, all of which can be shown at the Gem. The main floor Gem Gallery aspires to be a contemporary gallery on par with quality galleries in larger cities. Technology arts include VR! The Gem was fortunate to have recently shown the work of three VR artists: Liz Altmiller, Karen Doty, and Mike Wilson as part of our Connections exhibit. The Gem is also working on a large collaborative installation with 15+ artists to create an immersive art experience, in which we’re hoping to include VR experiences. Virtual Reality art is an important new platform for artists to convey their vision. Like other artforms, the possibilities are endless and diverse, and each artist’s vision is unique. 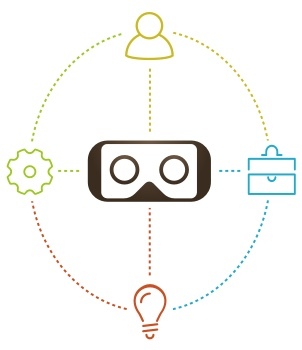 The Gem looks forward to working with the Idaho Virtual Reality Council and the local VR/AR community to be innovators of this new artform and technology. Jane Tharpe is the Board President for The Gem Center for the Arts. *Earth Space - Earth Space is a virtual reality experience in which the player interacts with Earth in an alternate universe 1000 years after a nuclear apocalypse. Everything on this unique planet is huge in comparison to the player’s size due to quantum and gravitational difficulties. The experience of being very small and the arduous tasks the player must endure contrasts with the planet’s whimsical vistas and airy music. ​This experience is about the relationship and connections we humans have with our planet and it speaks to the way our personal identity connects with the world and to the complex emotions we experience in response to it.